Is it really Monday already? Usually I move slow like a snail on Mondays. Today I think I am molasses in January. Last night I barely got five hours of sleep. When I don't sleep I get cranky and lack the motivation for anything. You see, I have a problem. I've had this don't know how to fall asleep problem since my early 20's. Back then life became stressful. I was a single mom of a holy terror of a little girl (Goose), lived by myself, worked part time to pay the bills and spoil my daughter, and was a full time student. I remember staying up past midnight writing papers and studying for tests. Then waking early by 6:30 in order to get my daughter ready for preschool and myself off to class or my job. The insomnia started with me laying in bed for a half an hour before falling asleep. As the years passed that half an hour turned into one hour, then two, then three and then about five years ago I would lay in bed wide awake all night long. When I am stressed out, and well, just about any other time day or night, my brain refuses to shut off. I am constantly thinking about the past day, worrying about my kids. Wondering if I did the right things to make my husband happy. Thinking about my friends and family that I left behind back in Wisconsin. And wondering when my next adult conversation will occur. I think about my blogs. Compare myself to other bloggers. Wonder if I got enough page views and comments that day. Worry that I am spending too much money promoting my sites and not getting enough in return. Wondering when I will be able to pay myself again. Worrying about whether I should just call my blogs a hobby and just forget about making money. Heck, I'm touching lives and making new friends, right? Shouldn't that be enough? A couple of years ago my doctor put me on trazo-done for my insomnia. This medication is usually prescribed to treat depression, but sometimes it is used for insomnia because one of the side effects is it makes you drowsy. I started with only 25mg. After a while it stopped working for me so today I take 100mg of the stuff. But taking trazo-done alone does not work for me. I also need to take 50mg of diphenhydramine and Alteril. Along with what Chris calls my "night time cocktail," I also need the room to be dark and quiet in order to fall asleep. The smallest noise will keep me awake. One night Chris had his watch sitting on his desk by the window in our bedroom which is about 10 feet from my head in our bed. When I was trying to fall asleep that night I kept on saying, "Chris can you hear that ticking sound? There is a loud ticking sound and it is driving me nuts!" We had no idea what it was until the next morning. A couple of nights ago I decided to try wearing ear plugs to bed. Even Chris' snoring keeps me up. They worked great the first night I wore them, but last night I still heard every little noise in our bedroom. I laid in bed awake from 10:30 until about midnight. Then I went downstairs to the couch. I think I was awake for another hour before I finally fell asleep. Then I woke up at 4am and had to pee. I decided to try going back to the bedroom. Again I laid in bed awake for what felt like eternity until I fell asleep. My sleep was interrupted at 5am by the voice of my little Monkey singing a song he learned at preschool. Why do they have to wake up so early? Why do they always have to wake me up? 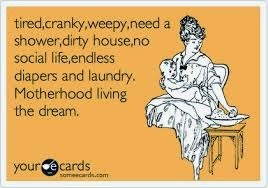 Why do I have five whiny, messy, noisy little people running around my house calling me "Mom?" So today I am slower than molasses in January. I don't know when my dishes will get done or what I am going to fix for dinner. I also need to apologize to all my loyal readers. I don't think I am going to get around to reading and commenting on your blogs today. I promise I will do my commenting tomorrow, as long as I get a good night's sleep tonight! Are you a sound sleeper? Do you wake in the middle of the night? Do you have trouble falling asleep at night?